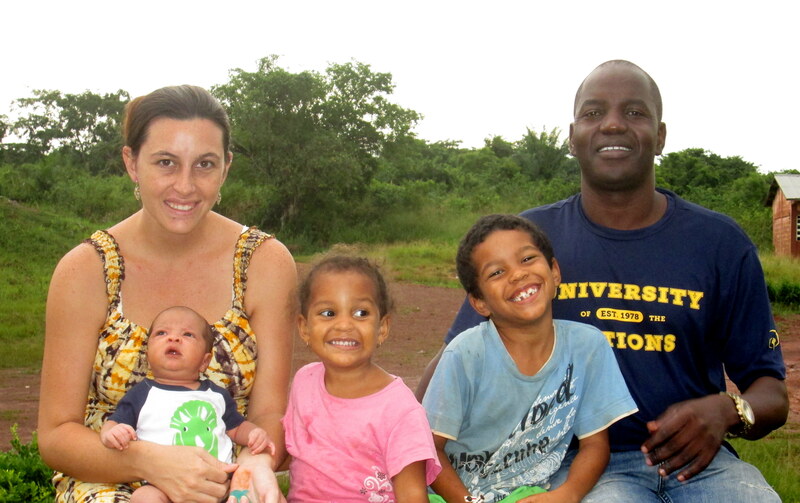 We are the Ouedraogo’s; Joseph, Meleah, Ezekiel, Nere-Waya and Judah. Our family consist of two nationalities, three different skin tones and four languages. We currently serve as missionaries with Youth With A Mission (YWAM) in Noepe, Togo, a small French speaking country in west Africa. Joseph and I met doing training with YWAM in Kona Hawaii where we fell in love and decided to get married. Since then we have been to four different nations doing training and missions work. In 2011, we settled in Noepe, Togo to re-pioneer a YWAM campus here. Joseph is from Burkina Faso, a French speaking country in west Africa. Meleah is from the USA, grew up all over the country but claims Colorado now. Ezekiel (who is 5) is our compassionate warrior with a passion for justice. He is faithful to pray, especially for the hurt and needy, and is extremely discerning and loves deeply. Nere-Waya is two, her name means “beauty has come” and it’s true of course, (as every biased mother would say) but its also true of how she sees the world. She has a keen sense for beauty. She loves flowers and the sky at sunset. She will break down in tears if her brother says her cereal bowl isn’t as pretty as his. Everything is, and should be, beautiful according to her. Our youngest Judah, just joined us in October, he is a wonderful baby who already loves to smile. Our family is unique and so are our celebrations, but we love to celebrate. Thanksgiving has always been one of my most favorite holidays and is full of wonderful memories for me. So even through we live in Togo, Thanksgiving is still always celebrated. Our biggest challenge is finding turkey; the first year we substituted it for some chicken that turned out so chewy it made beef jerky seem like mashed potatoes. Last year in a stroke of genius (and desperation) we had turkey deli meat, slightly sautéed. Yet no matter what, it still causes me to remember to take time out and be thankful for my life and teach my children to do it too. That is part of why we are doing Good Dirt. We want to be intentional about learning about God together as a family and to learn more about doing spiritual disciplines in our daily lives. I want all of our days to be opportunities to take time out to focus on what God has given us, not just on Thanksgiving day, and I hope doing this family devotional will do exactly that.